Sorry about the late post! I have been having difficulties with actually getting up and making an effort in this cold weather. That or I am just extremely lazy. Either way, here are my favourite outfits at the moment. The first one includes a black bustier which I have had for a couple of months now and never worn. Sad, really. Also, my new shorts, a chunky knit and a bow the lovely Maria made me. It's a bit experimental as I have never worn it (yet it is my favourite). Thoughts? 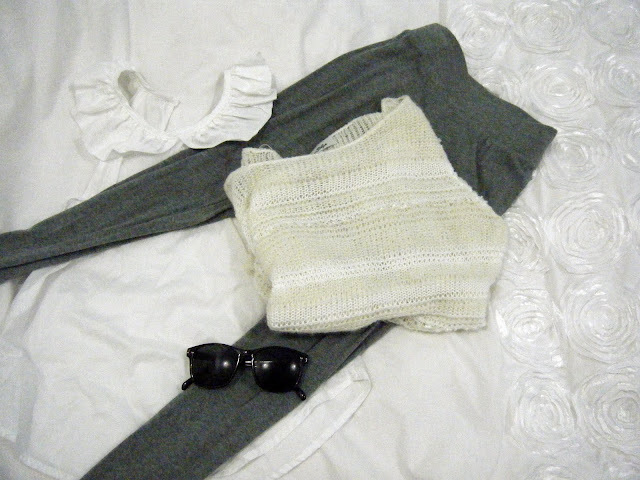 The second one includes the Miss Shop knit that I have been featuring in what seems like all my posts lately. As one of my lovely commenters said, "It is like a dream". Also, my peter pan collared shirt, tights and Ray-Bans. Feedback would be appreciated! Also, if you feel like giving your winter wardrobe an update, there is an amazing giveaway at Frankie Sunshine! you shouldnt say sorry for that! they were gorgeous!!! and your sense of style is already CHIC! i love it!! such a cute outfit sometimes i wish it was fall already! I love the styling! I can't wait to see you wearing that bustier, so gorgeous! Can't wait till it's winter here! It is funny that your favorite item is something you haven't worn. I have stuff that I love so much I don't wear it right away! And I, unfortunately, do the same with my little girl's clothes. It's like I save them for something special...and we never have anything "special" happening. I enjoy reading your ideas.